When I was in my early 20’s, a friend of mine introduced me to some books and teachings by a guy called John C Maxwell. I remember trying to get excited about reading them – but I just couldn’t. He was talking all about growing yourself, and being a better person, and personal development – and to be honest, I could not have been less interested. Skip ahead 10 years and those exact same books and lessons light me up like almost nothing else. Personal development has become such a huge part of my life, it’s now the reason I do what I do. In fact, I’ve since invested a considerable amount of time and money to become certified as part of John’s international team of trainers, coaches and speakers. Over the years I’ve read heaps of books, listened to a myriad of podcasts, watched countless YouTube clips, attended numerous conferences – you name it, I’ve done it – and I’ve learned so much along the way. Fill in the blank with whatever you want, it doesn’t matter. If you believe that sentence – you will never change, and you will never grow. You will never become the best version of yourself and you will never live the best life that you could live. There’s nothing that does my head in more than hearing someone blame someone else or something else for where they’re at in life – and trust me when I say, I catch myself doing it far more than I’d like to admit. The reason it bothers me so much is because I know every time I do it, I’m sentencing myself to more of the same, and so are you – and that’s the opposite of what we want to do. Are there exceptions to the rule? Of course. 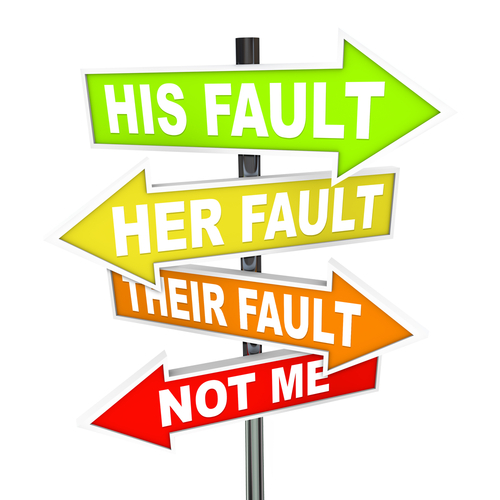 Is EVERYTHING that’s ever happened to you your fault? Am I responsible for everything that’s ever happened in my life? Sometimes things happen, and there’s nothing we could have done differently – but that’s rare, very rare. Once you become an adult and are (in theory) responsible for your own life and your own choices, those ‘Nothing I could have done differently’ moments are few and far between – in fact I could probably count mine on one hand. Here’s what I’ve learned: blaming others for things that I’m not happy about is just a recipe for more unhappiness. Taking responsibility for as much as I can, when I can, is confronting in the short term – but it’s the main ingredient for a healthy and fulfilling life.